Hey there! Welcome to JetSetting Fools – where you will find our best travel tips for destinations worldwide. Some of the links on this site are Affiliate Links and if you use them to make a purchase, we may earn a small commission. For more information, read our Disclosure Policy. Whenever we travel somewhere new, we go armed with a guidebook and, depending on where we are going, it’s either a Lonely Planet travel guide or Rick Steves guidebook. Our travel style doesn’t perfectly align with either, but both are great travel guidebook resources to have on hand when we need them. Lonely Planet tends to be geared to a younger audience, while Rick Steves often seems to be written for retirees. Both books provide budget-saving tips, as well as a snippet of history and practical information. 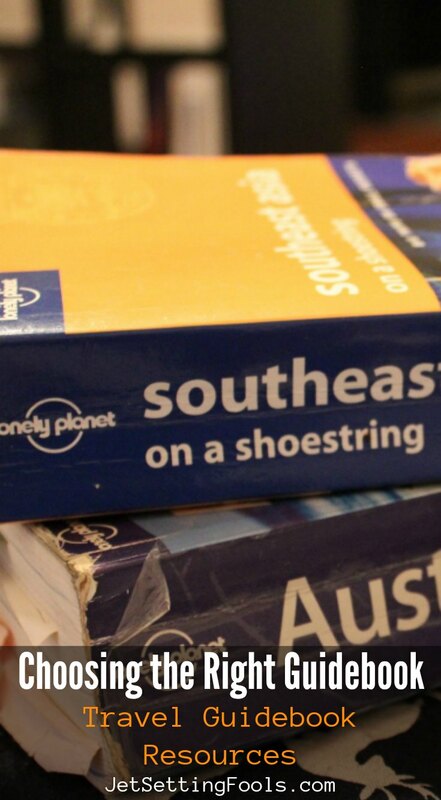 Lonely Planet books are available for destinations worldwide, while Rick Steves books are only for European cities and countries. While I do still prefer to have an actual book in my hand (or the torn-out section of the book that I need for a specific place we’re visiting), we have adapted to purchasing the Kindle version of guidebooks. There are pros and cons to the digital guidebook. No need to carry anything extra – the book is on my iPod, which I carry with me everywhere. Digital books are often less expensive than paper books. Unlike most ebooks, a guidebook isn’t read from beginning to end. We are constantly flipping through sections to get to the pertinent information when we need it – and navigating an e-guidebook can be utterly frustrating. To use the book, it must be downloaded, which requires a wifi connection. I’ve often forgotten this step prior to boarding the plane (where I usually do my research!). Tip: Lonely Planet has a deal where you can Get the digital chapters you want, ditch the ones you don’t! Only $4.95 per chapter! We do think having a guidebook is essential for any trip, however, researching online is equally important. Not only can you get current information and tips about destinations, but you can also get customer reviews. Take a look at our Travel Guides page to see if we have any detailed information for wherever you are traveling to next – or take a look at some of the blogs we follow. Wiki Travel is another great place to start when researching a new destination. We also recommend looking through Lonely Planet Thorn Tree Forum and TripAdvisor as you research your trip. For more travel planning information, tips and advice, go to our Travel Planning page. For country specific travel guides, go to our Travel Guides page. Travel well!